One of my biggest regrets coming out so late in life is a complete ignorance of the LGBT movement, now my movement—its history, beginnings, triumphs, and heartbreaks. Growing up, I was completely sheltered from all things gay. I knew nothing—absolutely nothing—about Stonewall, about Harvey Milk or his murder, about the AIDS crisis. (Despite my parents and I religiously watching all the network news over dinner through the 70s and 80s—Dan Rather, Peter Jennings, and Tom Brokaw were fixtures in our house at 5:30 p.m.—I have no memories of their coverage of about the AIDS crisis whatsoever.) I remember hearing nothing about Reagan’s seven years of silence about AIDS and only vague coverage of the AIDS Quilt which only generated disdain from my parents and church. And I recall Matthew Shepard only as a very brief news item—certainly nothing to call me to action. Or prayer. So to say I’ve had a lot of catching up to do is putting it mildly. It wasn’t until I came out that I finally allowed myself to watch Brokeback Mountain and identify my own pain; later, Milk and Sean Penn’s genuine and respectful portrayal of Harvey Milk would move me to tears and continues to do so. Since then, Google and various books and lectures and documentaries would begin filling in the gaps in my history—and my conscience. Like someone awakening into a reality that had been hidden from him, I emerged into a world I could not believe I had pretended did not exist—a people mercilessly persecuted for their identity and a generation of men allowed to suffer horrific deaths from a plague our country and its leaders refused to fight. 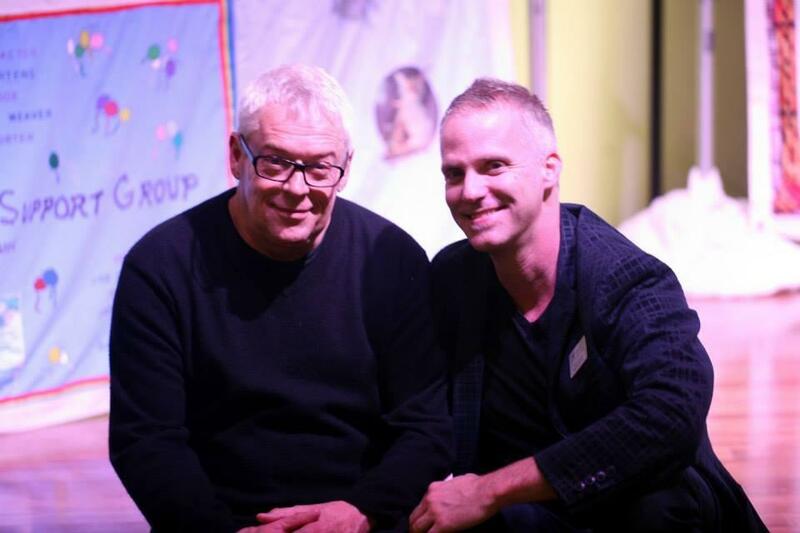 And then this past weekend, my education took a steep curve with the opportunity to meet and hear Cleve Jones, Harvey Milk contemporary and heir apparent and creator of the AIDS Memorial Quilt. I knew a little about Cleve from the movie; Google and Wikipedia had filled in the rest and a play featuring his words locked his essence in my mind and heart. Cleve Jones had already impacted my life. Meeting him in person and getting to know him only amplified the effect he will have on my future. From my first encounter with Cleve over dinner and then through his radio interview, a Q&A session, a reception, and a “sermon” he gave at our church (we kept him busy, something he would jokingly fuss at me about more than once), I observed several things. Apparently he’s not a fan of Texas drivers who talk with their hands while driving. I instantly noticed the glint of mischief and cocky activist that still twinkles in his eyes; though travel weary and emotionally exhausted, that twinkle never waned. I observed his stoic nature and watched him recall story after story—always delivered very matter-of-factly yet also somehow slightly blasé, as if to insulate himself from the recurrent memories evoked with each firsthand narrative he repeated for the hundredth time. Cleve was painfully transparent about the toll travelling with the Quilt and telling, retelling the stories, and of life spent on the road many weeks at a time. I observed the pain and grief of loss etched into the wrinkles of his face; there was joy there, yes, but also much sadness. Through my time with Cleve, I learned that this hero—and he is without a doubt a hero—is just a regular guy who was inspired to get off his duff and work to effect change. He admits his imperfections, his misjudgments, his mistakes, but he makes no apologies for his zeal and tireless advocacy. I was perhaps most moved when he recounted the times in his life where he had lost hope, as prompted by a question from our Interim Pastor Jim Mitulski, a peer of Jones in San Francisco during the epidemic. Cleve very solemnly yet economically took us through those moments when he had thought “it was over”—the sadness and despair was palpable and my heart ached along with his—to the realization that the exact opposite was true, that things were only just beginning and that in the worst of times, a community found its strength and voice. What a powerful example of faith—the reality of confident hopefulness amid the bleakest, and I mean bleakest, of times—is the life of Cleve Jones! In a span of 48 hours, I learned about that life. His fears. His loves. His regrets. His proudest moments. Here in the US, we lost a generation of gay men. Those left behind are survivors—either of the disease themselves or of the fallout; they lost friends and lovers and likely took care of someone who died. These survivors are often on their own—no children, no surviving partner, and little income equity. They—along with thousands of LGBT men and women who lost children in custody fights due to biased court systems—are the veterans of these wars. One, a war in the form of a plague that is still infecting and killing, and the other, a war for equality we are only just now seeing a turn in the tide. Our elders, many of them, like Cleve, fighting for the change we’re enjoying today, have very little access to affordable housing—much less healthcare—and very little assurance that will change any time soon. I learned—most of all—that we have to talk about this history, which includes a frank and open conversation about its ugliness but also its victories and lessons. We have to share these stories of pain and loss and grief and epidemic—not just fight for equality—with younger generations. And despite the pain, the older generation must continue to speak and share and tell. We must never fail to share this story of hope nor its origin! Whenever Cleve spoke of Dallas, he always mentioned the LGBT community’s kindness and compassion. Upon his departure, he remarked how much he enjoyed this trip and how much he liked our church. I can only hope that in some small way, our message of hope to our community and to the world–shown not just by words but by our actions–impacted him as much as he has impacted all of us. “…but we also rejoice in our afflictions, because we know that affliction produces endurance, endurance produces proven character, and proven character produces hope. http://www.thecastro.net/street/memoriespage/pritikin/pritikin.html I was a photographer who documented many of the historic movements including my iconic image of Harvey Milk with a bullhorn in one hand and a SAVE OUR RIGHTS sign in the background and was able to get Associated Press and United Press International to feature gay theme news 3 times within a 3 week period at a time it was seldom available on the wire services.I was able to get A.P. to run the story about a softball team I played on that was kicked out of the 1978 Gay Softball World Series for having too many non-gays on our roster that was mentioned on Walter Chronkites Evening CBS TV News. Jerry–thanks for sharing these memories with us and for your involvement in this movement! What a legacy!